RIDING THE BLUE RIDGE PARKWAY IN WINTER. While most motorcycle riders clean up their rides and store them for the winter. Those that live in the mountains ride any chance they get. This year winter temperatures have been in the 50′s, 60′s and even 70′s which gives no excuse to get out on the highway and enjoy the scenic by-ways. The Blue Ridge Parkway is just a stones throw from Rock-n-Creek Cabin which is biker friendly and offers secured covered parking for those treasures. Don’t wait till spring when there’s great weather now to get in the wind. Give us a call and make plans to visit our cabin ride to Crabtree Falls and experience the Parkway in winter. 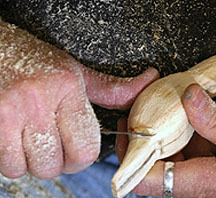 New creations are being made at the studio of Buck Island Bay Decoys with the introduction of Mountain Man Basketry. Rock-n-Creek Cabin inkeeper Richard Christy an accomplished Certified Executive Chef and veteran Decoy Carver expands his artisan creativity with his new venue Mountain Man Basketry. Traditional and functional baskets are hand dyed and woven using traditional methods. Baskets are created in old styles once used in everyday life by mountain folk of the Blue Ridge. Natural materials of oak splits, reeds and naturally shed antlers are used in some of Christy’s orginal creations. 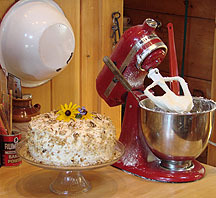 Wild grapevine, Honeysuckle and Virginia Creeper are also incorporated in utile creations. 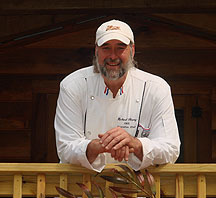 Look for the opening of the Mountain Man Basketry online store currently being developed at www.rockncreekcabin.com. Baskets are available for sale at Buck Island Bay Decoy studio. Contact studio at 540.377.9382 or office at 540.377.9383 for information. In whatever comes our way!! Rock-n-Creek Cabin is your Biker Friendly cabin in the woods. Starting in the Spring of 2012, Guided Motorcycle Tours will be available for those adventurous bikers. Nestled in the Blue Blue Ridge Mountains the landscape offers beautiful scenic rides along one of the most breath taking by-ways in Virginia. Most sightseeing is done along the BRP. Rock-n-Creek creates your ride along the the non-publicized routes through the back roads of true mountain scenic beauty. Your touring route will be customized to exactly what you or your group would like to see. Your touring package will include two nights Lodging at Rock-n-Creek Cabin, Two Country Breakfasts before your ride each morning by a Certified Executive Chef, Two Picnic Lunches during your ride,Two Guided Scenic Routes. Wind down that evening after your ride around a campfire sipp-n on a cool one talking about that great ride today. Packages are available for 1-12 person(s) from April-Oct. 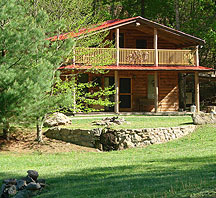 Contact Rock-n-Creek Cabin (540.377.9383) for full details and reservations for your Great Mountain Adventure. Wine a bit ! Everyone needs to wine sometimes ! Pack your bags stay at Rock-n-Creek Cabin and hit the Monticello Wine Trail. Enjoy the many Vineyards in Nelson County and surrounding areas. Go ahead and Wine a bit, hopping from Vineyard to Vineyard meandering your way back to your mountain cabin. Sit in the shade, pull ah cork and RELAX. Walk the wildflower paths while get-n your sippy on, working your way back to a gourmet meal prepared on site and served on the veranda dining Al-Fresco. Serenaded by the night creatures, spring peepers and bull frogs. Now that’s the kind of wine-ing we can all tolerate. You read this right! “Glamping” It’s the new way to enjoy camping. Except you don’t have to pack your car and tote all that camping gear. You will never have to set up another tent in the rain, find a level spot to pitch that tent or build a make shift pottie. Glamping is GLAMOROUS CAMPING. Pack your Jelly Bucket get in your car and head to Rock-n-Creek Cabin for your Glamping experience. Stay in the comforts of home, have a professional chef prepare your meals, get back to nature and enjoy the out of doors without the hassles of all that gear. www.rockncreekcabin.com is the answer. WHERE YA AT? ?